we got almost and extra year with our sweet Girl, and a good year. autoimmune disease that took hold of her, it would be much more difficult to put into remission. They were right. For the past almost month we have tried. Everything. I prayed all the way home last night on our midnight ride from the Yoop that God would give us another miracle for our Girl, just a tiny one. Just to make her well enough to be able to come home to feel good enough to take her walk down the Lane and around the Farm. Take a ride through the fields on Reba....my Shotgun Rider. My heart breaks as I say that it wasn't meant to be. She was a critically ill Girl and there was no modern medicine to give her those extra days or hours we so wanted with her. I always remember a friend telling me many years ago, when at the door of making this decision for someone you love so, you must always remember to think with your head, not with your heart. We told ourselves that over and over and although our hearts were screaming, no, no, no....our heads told us, that what was best for her was to let her go. It was time. We made the heartbreaking choice to say our last goodbyes. We spent time with her. Showing her the love she has always known and telling her we didn't want to say goodbye but we wanted her to be free from the suffering. I held her sweet, sweet face and could read in those sad brown eyes the pain she was feeling and I knew we had to let her go. I kissed her soft snout as Pops caressed her forehead. She closed her eyes, nuzzled my face and let out a long last breath. We knew instantly that she was at peace. We also knew our hearts were shattered. Peace will come for us in time. We will miss our Miracle Girl every day. Every single day. She now runs free and we choose to think she has met up with her big Sis Grace and most likely her Momma Ginger. We also believe that we will meet them all again. God would not put these wonderful beings among us on earth if he had no place for them in heaven. Run with the wind sweet Sophie! It's the hardest thing we ever do, I think. But so necessary to let go when it's time. She had the very best life with you to love and care for her. Run free, Miss Sophie Lee. My heart breaks for you, Sharon. 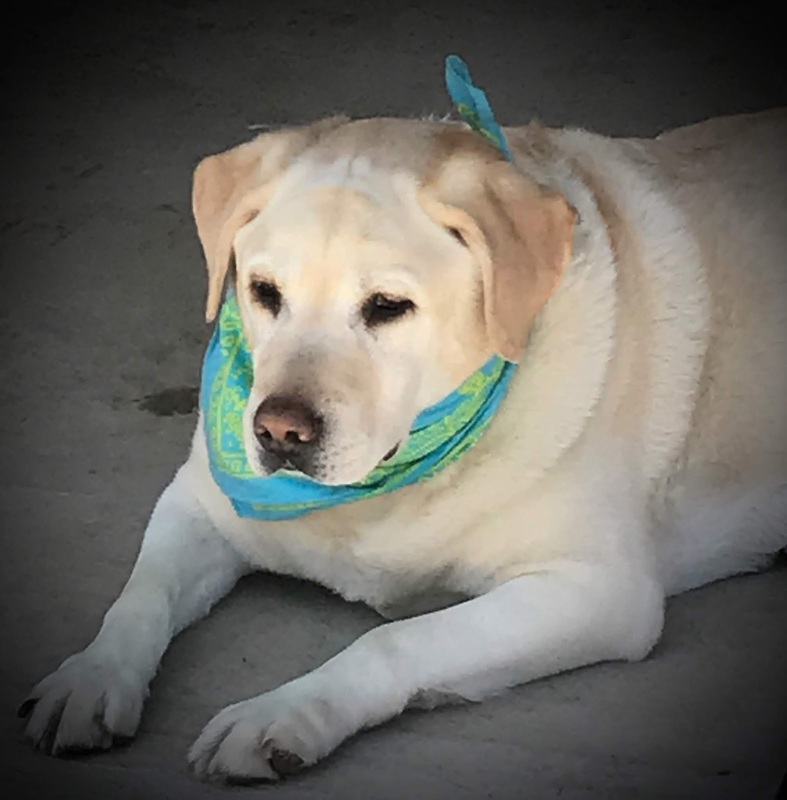 Sweet Sophie Lee was blessed to live her life with you on Yellow Dog Lane. Words can’t quite describe the ache and emptiness we feel when it’s time for our beloved furry companion to leave us. May your memories of her bring you peace and healing. Oh Sharon I am so sorry to hear about Sophie. Here are big hugs for you and Wayne. I have also lost dearly beloved pets and know the pain you are going through. Please know you are in my thoughts. Dearest Sharon, I'm truly sorry for your loss, but may I say the words you chose, the heart felt love you gave endlessly is a true testament of quality pet ownership. I too lost my 5 year old Lab on January12 this year, not a day goes by without thought or reflection of our bond. May you find peace, happiness and a new puppy to fill both your heart and theirs. Sending you a big hug and healing times ahead. I am so sorry to learn about the loss of sweet, sweet Sophie. You have given her such a wonderful life living on the lane and one day you will be reunited with her again. Praying for healing and peace during such a difficult time. sending hugs. Thank you Lynnly....it's been a rough couple of months and just now reading the posts. Your love sent is appreciated. And here was your article about your sweet pup. We lost our sheltie last night. We did not know how sick she was till last week when we noticed her bathroom patterns were not like the familiar. By Sunday, my hubby said we should have her checked in case it is something that may not be bad, and if we wait, she will be more uncomfortable and perhaps cause other issues. We do not have money, living on social security and a small part time job, (my husband is a pastor), we found out that she was very sick and it was going to cost hundreds of dollars to have tests, which we could not do. The vet sent us on our way telling us to enjoy a few days with her. I couldn't believe that was the response, and the amount of money I needed that day to find out what was really wrong. Yesterday, Tuesday, three days from going to the vet, our dog had to be put down. To see my pet suffer as she did just ripped my heart. One week ago, I never knew this was going to be happening. So, tonight, after burying her in our yard after preparing a spot for her which took hard labor and much time by my husband and myself, I lay in bed, not hearing her tags jingling, her tail wagging, sleeping by my bed, I need to go to sleep and rest.